You're a smart guy. Smart guys know that you don't mess around with UV rays, especially when it comes to your vision. So you need to protect yourself from sun damage. Cataracts, macular degeneration, corneal sunburn, and skin cancer around the eyelids are just a handful of problems you can expect when your eyes get too much UV exposure. And there is just no reason for you to go blind when protection is so readily available. If you are outside during the day you need a good pair of sunglasses for men if you want to protect yourself from UV damage. If anything, get a pair of cheap sunglasses. Sunglasses aren't just for sunny days either. UV protection is equally as important on cloudy days when UV rays have a straight path to your eyes. For that reason, it's incredibly important to choose the right sunglasses, which can be a lot of work. Lucky for you, we at Faveable have done the work for you. We spent hours researching, reading, reviews, and talking to guys like you to find the best sunglasses out there. We guarantee our list has something for everyone! These sunglasses are very budget friendly. They have a color and print for everyone and never go out of style. I wouldn't go with the matte grey frames. Several reviewers had issues with the paint bubbling and flaking off, but every other color seems to hold up well. Basic, acrylic lenses with 100% UV ray block. Most come fitted with standard dark grey lenses but some styles have different lens options. These sunglasses are made of plastic in a huge selection of colors and prints. The Wayfarer shape never gets old. It goes with anything and looks great on anyone so these are a good go-to if you aren't sure which style of sunglasses looks best on you. They have a color and print for any personality. Bring on the 80's! These are some killer shades that pretty much guarantee that women will notice you and the insane confidence it takes to pull off these awesome sunglasses! The only complaints we found about these are they can be too narrow for wider face shapes. Brodies have impact resistant polycarbonate lenses in a funky wraparound style that also gives you added peripheral protection from UVs . They also come in a big selection of colors and all of them block 100% of all UV rays. Basic plastic frames in 11 colors. Lightning bolt shaped ear pieces and bold colors, these frames come in any color you could want. They are in your face, over the top, and tell the world you are a fun confident guy that doesn't suppress your wild side. These glasses are pretty sturdy and come with a durable protective case, but we doubt once you put these on you'll ever want to take them off. If these glasses sound fancy, that's only because they are. These sunglasses look great, feel amazing, and assert confidence and style. Check the measurements. For broader face shapes these sunglasses may be a little narrow. Scratch resistant and virtually break-proof, these polycarbonate lenses filter out 100% of all harmful UV rays. They come with two sets of lenses, a grey blue color and a spare set in mirrored mercury silver. These stylish frames are made of a black colored titanium metal. Porsche Design takes the classic Aviator shape and steps it up a notch with sleek style that pairs well with a sharp suit or amps up an everyday casual look. These are some tough sunglasses. Titanium is a 45% lighter than steel and just as strong. Active guys need sunglasses that can hold up through the toughest conditions and these sunglasses fit the bill. They look great and feel comfortable when you're working up a good sweat. Not many complaints about these shades, but some guys mentioned it would be better if they came with a spare set of lenses. Lenses: These lenses fell like looking at the world in HD. They are crystal clear and will not distort your vision when you're in motion. Iridum lens coating reduces glare, and the Plutonite lenses filter out 100% of UVA, UVB, UVC, and blue light from eletronic devices that can strain your eyes and mess up your sleep cycle. They come in a wide selection of different colors too. Frame: Made of lightweight O Matter with Integrated surge ports, these frames come in a handful of different colors that channel airflow to keep you cool. Ther are also different nose peice options you can swap out to perfectly fit your nose without slipping. Design: Radars look great and feel weightless and comfortable whether you are running a marathon, cycling, or hanging out on the beach. Durability: These sunglasses can handle anything you throw at them. They are both smudge and dirt resistent and super strong, so they can handle getting down and dirty. When you think Aviators you automatically know that Ray-Ban is the way to go. These shades are a staple for any guy who wants style points. There can be a surplus of knock-offs from third party suppliers. Make sure you pay the extra money to buy directly from Amazon to ensure you get authentic Ray-Bans. 100% UV protection and so many different styles to choose from, but our favorite pick is the Crystal Grey Mirror lenses. There is a huge selection of different options, but the silver-colored metal frames match the lenses perfectly. Aviators first hit the big screen in 1961 and have been a staple of celebrity wardrobes ever since. Sleek, stylish, and timeless Aviators compliment a strong jawline and sharpen facial features. You and the ladies will love these shades. Authentic Ray-Bans are tough, but not Oakley tough, so make sure you store them in the case when not in use. Oakley is committed to quality in their products. That's why we have two styles on our list! The company has high standards for their sunglasses and you can tell from the moment you put them on. Oakley was bought out by Luxottica Group (the same company that owns Ray-Ban) in 2007, and some reviewers think quality has suffered since some glasses are now manufactured outside of the United States. Each pair of lenses are cut from a single lense shield for optimum symetry. There are a few other features that make these lenses stand out from the rest: XYZ optics for lense clarity that doesn't distort your vision from different angles, extreme impact prtection above and beyond the minimum safety requirements, and Plutonite lenses filter out every bit of UVA, UVB, UVC and even blue light emitted from phone screens and TV's that interfere with circadium rythms and can cause eye strain and fatigue. The frames are made of Oakley's signature O matter plastic. GasCans are known for their agressive and masculine style. They have a sporty look that is perfect for everyday wear. There is a reason Oakley's are approved by the US miltary for combat. These glasses are made to take a beating and still hold up. You won't find anything that stands the test of time like these sunglasses. When it comes to sunglasses, function is as important as form. Sunglasses aren't just intended to make you look cool, though they do a damned good job of it. They're meant to protect your eyes from the UV radiation in sunlight, and to prevent the squinting that leads to wrinkles at the corners of your eyes. While they're a stylish accessory, they're also important for your eye and skin health. UV light is dangerous. Sunglasses without 99 to 100% UV radiation protection could expose your eyes to serious damage. While UV rays do encourage your skin to produce more Vitamin D, excessive exposure to light can cause cataracts to form in your eyes. There may also be damage to your retina, and over time you may develop tissue over your eyeballs thanks to the UV radiation. Sunglasses should always provide you protection from those UV rays. Cost isn't the deciding factor. A $350 pair of sunglasses with 100% UV protection isn't more effective at protecting your eyes than $20 pair of sunglasses with 100% UV protection. The pricier glasses may be more stylish, but the most important feature of any pair of sunglasses is that protection against UV rays. Casual – These sunglasses are more form than function, and they're created for use in everyday casual activities: walking around the mall, lounging in your backyard, etc. They are made with simple, stylish frames and lenses, and they tend to offer 100% UV protection. On the downside, they're not the most durable, and they're not built to stay in place like sports or performance glasses. For casual use only! Sports – Sports sunglasses are designed for high intensity activities: everything from hiking to rock climbing to running to surfing to cycling. They tend to weigh less than casual glasses, and are usually made from durable materials that are impact-resistant, scratch-resistant, and flexible. They may also feature grippy rubber nose pads and ear tips to keep them firmly in place as you move around. They could even come with interchangeable lenses according to the type of activity you're doing. On the downside, these glasses tend to be pricier than casual glasses, and they are definitely built more for function than form. Prescription – Prescription sunglasses are special glasses that include both vision corrective lenses and UV/sunlight protection. They have to be custom-made for the wearer, and tend to be much pricier than typical prescription wear and regular sunglasses. They can be made for active use, but they are typically worn for long-haul driving or use on water. Glacier – Glacier glasses are designed for mountaineers, rock climbers, and other high-altitude activities. They are designed with special UV protection and glare-reduction that will reduce the risk of damage caused by intense light at high altitudes, or from sunlight reflecting off snow and ice. They tend to be wrap-around glasses that cover your eyes entirely, preventing light from filtering through the sides. Glacier glasses are definitely pricier, and they tend to be less versatile than sports glasses. They may also distort your view. Driving – Yes, there are such a thing as "driving sunglasses". Essentially, these glasses are built to cover your eyes completely, protecting them from glare and UV radiation. However, they also have slimmer frames that won't interfere with your field of vision, allowing you to see out of the corners of your eyes without having to turn your head completely to check your blind spots or side-view mirrors. Their slimmer frames make them more susceptible to damage, which is why they're intended to be used primarily in your vehicle where there is very low risk of damage. Your sunglasses are manufactured for two specific purposes: to prevent glare and excessive brightness from hurting your eyes, and to protect your eyes from UV radiation. UVA – UVA rays account for 95% of the UV radiation that filters through the atmosphere and hits the surface of our Earth. There is no intensity variation throughout the year, and they are far less intense than UVB rays. However, there are 30 to 50 times more UVA rays than UVB rays, which makes them more likely to contribute to photoaging (premature aging of the skin caused by exposure to UV rays), as well as skin cancer and certain types of cataracts. UVB – UVB rays make up just 5% of the UV radiation hitting the Earth's surface, but they are very intense and can be hazardous to both your skin and eyes. UVB rays are at their strongest between 10 AM and 4 PM during the summer months, when the axial tilt of the Earth toward the sun focuses the UV rays. Their effect is amplified by snow, and they can damage your skin (causing sunburn) and eyes (causing cancer and retinal damage) throughout the year. When shopping for sunglasses, you MUST find a pair that offers at least 99% UV radiation protection, though 100% protection is better. The glasses should protect from both UVA and UVB rays. Thankfully, the vast majority of glasses manufactured today come with UV protection integrated into the lens, and at no extra cost. However, parents beware: many children's and novelty sunglasses DO NOT feature UV protection. If you're going to get sunglasses for your child, make sure they include protection from ultraviolet light! 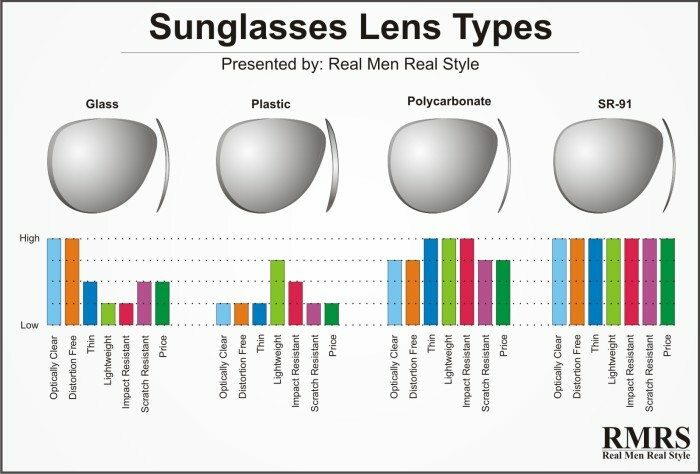 There are A LOT of sunglass frame styles to choose from, as you will see below. It can be overwhelming to see the dozens of different shapes, styles, materials, and sizes, and you may have no idea how to buy a pair of sunglasses. Don't sweat it! We'll walk you through the process, starting with the right sunglass frames. When thinking about sunglass frames, you need to start with the size. Your frames should be sized according to your face size—i.e. smaller faces = smaller frames, larger faces = larger frames. Bridge Size refers to the distance between the lenses, where the glasses will sit on the bridge of your nose. It can be anywhere from 14 to 24 mm. Eye Size refers to the measurement from the outside edge to the inside edge of a single lens, meaning the width of the lens itself (sans frame). It can be anywhere from 40 to 62 mm. Temple Size refers to the length of the arm piece (also known as temple piece or ear piece), the part of the sunglasses that runs along the side of your head and sits atop your ear. The typical length of the temple piece can be between 120 and 150 mm. These measurements can help you find sunglasses of the ideal size according to your facial structure. Steel – Steel is resistant to corrosion, malleable, and easily adjusted, making it one of the best materials for glasses frames. However, steel frames usually aren't suited for active use, and they tend to be both pricier and less durable than other materials. Titanium – Titanium is a very durable metal, one that is primarily used for high-end sunglasses. It's pricier than stainless steel, but is very scratch- and damage-resistant. Definitely a good choice if you don't mind paying a high price tag. Nylon – Nylon is a lightweight, strong, and inexpensive material, one that mixes the flexibility required for active use with durability and stiffness to protect the lenses. It's the ideal active/sports/performance frame material, and will usually cost less than other materials. Plastic – Cheap is the best word to describe plastic frames. You'll find most sunglasses in the $1-$5 price range are made with plastic frames, which offer decent durability and versatility. However, they won't stand up to heavy active use. Injection-molded plastic is one of the most inexpensive options for making sunglasses. Acetate – Acetate is similar to plastic, but is stronger, lighter, and more flexible. Color is usually embedded in the material of the frames, making them more versatile in terms of style and form. Polycarbonate – Polycarbonate is a tough, versatile form of plastic that is resistant to impact. However, the frames are less flexible. They're included in many sport and safety glasses, or in glasses for young children. Horn and Shell – Glasses can be made from water buffalo horn, tortoise shell, or other animal-derived materials. These materials tend to be more comfortable than synthetics, not to mention more luxurious and pricier. However, they may lack the durability of synthetic materials, and you can expect to pay VERY high prices (up to $20,000 for a tortoise-shell frame). Wood – Wooden sunglasses have become a popular material, particularly among the eco-friendly community. They're not as durable or versatile as metal or synthetic frames, but they're a very clear fashion statement. For those looking to "go green", bamboo is also used to make frames. Each material has its own unique benefits, and you should choose the material that suits your needs best. Next, it's time to get into the various styles of sunglass frames available. Suffice it to say there are A LOT of styles, but we'll take a look at the most common ones. Aviators – Originally made for pilots, these sunglasses are large, covering the whole eye, and feature convex lenses. They're usually made with metal frames and a double or triple bridge. Clubmaster – Also known as "horn-rimmed", these glasses have rounded lenses with slim wire around the bottom and large upper rims made of plastic or synthetic materials. They're a throwback to the 1950s, and are an attention-getting style. Wayfarer – Wayfarer glasses are the most popular today, with a shape midway between circular and round and horn rims to accentuate the top of the glasses. They tend to be made of plastics or synthetics rather than metal. Butterfly – These oversized glasses are intended as a fashion statement, with exaggeratedly large circular or square lenses that offer ample coverage to the eyes. They offer excellent coverage, but are more form than function. Rectangle – Rectangle frames are often used for sport glasses, with a frame that is visibly wider than long. They tend to be made of acetate, plastics, or synthetics, but may be made from metal as well. Shield –Shield glasses are performance/active eyewear, with a wraparound style that covers your eyes completely—front, top, and sides. The rubber nose grip will keep the sunglasses firmly in place no matter how much you move. Wrap – Wrap glasses are similar to shield, but with a more aerodynamic feel to them. The lenses curve around the side of the face, offering total protection from the sun. The spring-loaded arms are ideal for sports and other active activities, which is why they're typically made from polycarbonate. Notch Bridge – These glasses will typically have circular or square lenses, but with an extra large notch in the bridge of the frames, above the nose. They may be foldable, making them the most compact type of sunglasses. Round – Rounded frames are the classic John Lennon style, and can be made using metal, plastic, and synthetic materials. They're versatile in terms of frame materials, but not use. Clear – Clear-frame glasses are made using translucent plastics or synthetic materials, and they can be made in any of the styles listed above. Half-Frame – These glasses typically have a frame on the top half of the lens, while the rest is left open. They tend to be more delicate than full-frame glasses, so aren't typically used for sports and active performance. Frameless – Also known as "rimless", these glasses are built with two ear pieces, two lenses, and the nose bridge, with no frame to attach them all together. They're very stylish, but the most delicate type of sunglasses around. They're more commonly used for reading, prescription, or driving glasses. Now that you've found the frame that suits your needs, it's time to move on to choosing the right type of lens. Optical glass – These are the same quality of glass used for eyeglasses, and the glass is ground and polished to be as distortion-free as possible. It's durable and resistant to scratches, but they are pricier and may break on impact. Plastic – Plastic is a cheap material, one that is easy to work and shape, making it the best choice for low-end glasses. The material is lighter and more shatter-proof than optical glass, but they tend to be thicker and must have an added coating to protect from UV radiation and scratches. SR-91 – SR-91 is a proprietary material created by Kaenon Polarized, and it's a non-polycarbonate that is highly scratch and damage-resistant, provides anti-glare and UV protection, and is beautifully lightweight. On the downside, it's very pricey! Polycarbonate – Polycarbonate is highly resistant to impact (50 times more than glass!) and is lightweight, without affecting optical clarity significantly. However, it's easily scratched. NXT Polyurethane is an example of a high quality polycarbonate. Green and grey are color-neutral, and they can reduce light intensity without altering colors. They can reduce eyestrain in bright environments and are ideal for driving glasses. Yellow, gold, and amber are great for depth perception and contrast, but they offer less protection from brightness. They're better for low- to mid-light environments, as well as for use in snow sports. Brown enhances light quality, cuts out neutral browns, and improves both depth perception and contrast. However, they can distort colors. Blue and purple are purely a cosmetic choice, as they provide very little protection or contrast. However, they can reduce glare and enhance color recognition. Rose and vermillion are good at enhancing contrast and low-light image resolution, and they can block the hazier blues. They're also less likely to strain your eyes, and are suitable for most activities. Mirrored/Flash Coating is a reflective film that has been applied to the outer surface of the lens. It will reduce glare by reflecting the light that hits the glasses' surface, making mirrored or flash coating ideal for people with high sensitivity to light. Photochromic Coating is a coating that enables the lenses to adjust to the light of their environment. In low-light conditions, they are brighter, but turn darker in bright environments. Gradient Lenses feature a tint that is darkest at the top and non-existent at the bottom. This gradient helps to block out overhead light while still permitting light to pass through the bottom half of the lens. This is typically used in driving sunglasses. Polarized Lenses are coated with a material that reduces the glare of REFLECTED light, such as off the snow, water, road, or passing vehicles. They're common in sports, glacier, and driving glasses. When buying sunglasses, the first thing to consider is ALWAYS the size of your face. A pair that is poorly sized will let UV rays past the frames and lenses, increasing your risk of skin cancer, cataracts, and eye damage. The sunglasses shouldn't touch your eyelashes, but should be large enough that you can blink without feeling your eyelashes brushing the lens. They should also sit comfortably on your nose without sliding down or falling off. But shape is also an important thing to factor in. Heart-shaped faces – With a broad forehead, narrow jaw, and pointed chin, aviator sunglasses help to complement your face. Rimless glasses are also a good way to avoid making your face appear top-heavy. Narrow faces – With a long, slim face, try circular, squared-off, or tall frames. These glasses will occupy more of your face, creating a better balance. Thicker arms and decorative temple features (common on horn-rimmed glasses) also draw attention away from the length of your face. Trapezoidal faces – With a face that is wider on the bottom than the top, use a cat-eye or half-rim style of glasses to balance a heavier jaw and focus the attention on the top of your face. Square-shaped faces – With a strong jaw and broad forehead, oval and rectangle-style glasses with rounded edges will soften the features and make the face appear longer. Round faces – With a round face, go for sunglasses that have rectangular, angular frames. Focus on a contrasting bridge to help the eyes appear farther apart. Shield and wrap sunglasses also work well for this face shape. Oval faces – With broad cheekbones but a narrow chin and forehead, butterfly-style glasses are a good option. Look for glasses that have heavier upper rims and slimmer/smaller lower rims. The good news is that most styles will work beautifully on an oval face! Thai TanPolarize lenses are the way to go. Should I get polarize lenses?